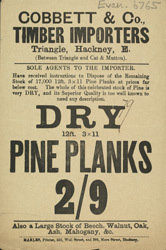 This is an advertisement for Cobbett and Co., timber importers based at Triangle in Hackney. Hackney was still relatively rural until the end of the 19th century. In the north and west of the village nursery gardens were prominent but in the south and east industry was growing. Clothing, shoe making and furniture production were the main occupations for those living there. Timber importers like the one featured on this leaflet would have supplied local firms with the wood necessary for making furniture. As can be seen from their stock pine, mahogany, beach, oak, ask and walnut were all popular materials.